It will be here, eventually. Tesla (TSLA - Get Report) has recently begun ramping production of the Model 3, the latest model in its vehicle lineup. However, CEO Elon Musk hasn't been shy about the company's future goals and new vehicles. While the Model S is a great car, the Model X was aimed at those looking for an all-electric SUV/crossover alternative to a sedan. While both vehicles support premium performance, they also come with a premium price tag, hence the desire to build the Model 3. That comes with its own concerns, specifically around the task of profitably building and selling the base version of the Model 3 (which Tesla has not yet done). Tesla produced more than 53,000 vehicles last quarter and has a backlog to build plenty more. That's lured in automotive giants like General Motors (GM - Get Report) , Toyota Motors (TM - Get Report) , Daimler (DDAIF , BMW, Audi, Jaguar, Porsche and others. As a result, Tesla knows it needs to build more cars and offer a larger lineup to its customers. While the Tesla Semi is not an offering for the everyday driver, it is one that Tesla plans to build. That's alongside the Model Y, a more affordable version of the Model X, the Roadster and the Tesla pickup truck. Specifically taking a look at the Semi, though, recent reports shed some new light on its production timeline. When Musk first introduced the vehicle, he said the company would look to begin production in 2019. Those reports now say that production will begin "earnestly by 2020." Some are taking this to mean that Tesla has missed yet again another self-imposed deadline. But at least by the language of this update, it doesn't seem like it's delayed, or at least significantly so. "By 2020" may very well mean production will begin next year. It's already received pre-orders from a number of companies, including PepsiCo (PEP - Get Report) , Anheuser-Busch (BUD and Walmart (WMT - Get Report) . In fact, Walmart originally placed its order for 10 trucks back in November 2017, before upping that order to 40 trucks just earlier this month. We've already seen prototypes of the vehicle and Musk has stated since its introduction that Tesla has been busy making improvements to its semi. It's fair to question when the semi truck will hit the open road, but I would argue that - at least based on this report - it's not fair to say production of it is being delayed, as some publications have. 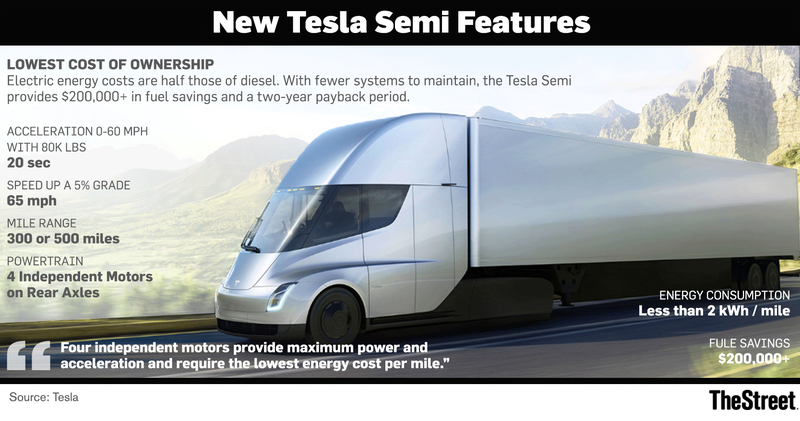 One may inquire where Tesla will produce the semi. The company has already said it will need a new location for producing the Model Y, which management expects to begin production around mid-2019. While the Model Y will have much higher volume than the semi, the latter's production location is a valid question given that we have less than 18 months before hitting 2020 and Fremont is already pretty tight on space. Additionally, one could ask how Tesla plans to pay for production and the R&D going into the semi. Twice now the company has slashed its capex guidance for this year, as management attempts to curb spending and reduce its cash burn. If they can successfully generate positive cash flow this quarter and next, along with GAAP profitability, perhaps the semi truck project will start to see more funds flow its way. These are valid issues that may cause a delay for the Tesla Semi, but so far, we have no confirmation that it's an issue. So when can we expect to see this on the road? Apparently early 2020 would be a good time to start keeping an eye out for it. With Tesla, though, it's sort of a moving target. One advantage Tesla could have? Given its advances in autonomous driving applications, Tesla could be a leader in the autonomous trucking industry as well. TheStreet has been covering that technology more and more as logistics companies and operators look to improve their efficiency and cut down costs.